Cultivate mental toughness with the 40 percent rule. Over seven years ago, Jesse Itzler, alongside his six person relay team, stood on a grass field stretching in preparation for an ultra-marathon. Each marathon runner per team would take turns running twenty-minute legs for twenty-four hours straight. The team that completed the longest total distance over the twenty-four period would be crowned the winner of the relay race. The night before the race, Itzler and his team flew into the marathon campsite to set up their tents, supplies of food, water supply, band aids and a masseuse for messages. On the day of the marathon race, about ten feet away, a Navy SEAL competing as a one man team, sat on a folding chair, with arms crossed and a “don’t mess with me” expression on his face. Itzler couldn’t help but notice this Navy SEAL with his twenty-four supplies consisting of just one bottle of water and a bag of crackers. Unlike the rest of the ultra-marathon runners who weighed around 165 pounds, the Navy SEAL weighed over 260 pounds and stood out as the only African-American in the race. “A cross between a gladiator and the G.I. Joe action hero my son has, but life size. He looked indestructible. Battle tested. Dangerous. Alone. Determined. Once the race started, Itzler made sure to not keep his eyes off the lone wolf Navy SEAL. The Navy SEAL ran as though his life depended on it. He didn’t stop or take breaks. He ran a hundred miles non-stop. After the twenty-four hour race was over, Itzler followed up on the status of the Navy SEAL, who was being carried off the marathon site with broken bones in both feet and damage to his kidney. Itzler was mesmerized by the mental toughness of the Navy SEAL. Prior to the race, he felt as though he needed to escape the rut and comfort of his daily routine. After witnessing the Navy SEAL finish the twenty-four hour race single-handedly, Itzler decided to push himself outside his comfort zone by asking the Navy SEAL to live with himself and his family for 31 days, during which he would do anything the Navy SEAL commanded. 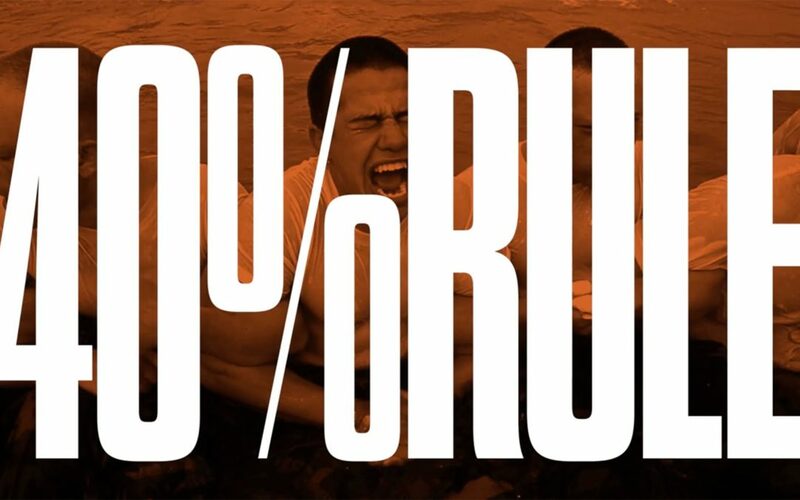 This was the beginning of Jesse Itzler uncovering the secret of Navy SEAL’s mental toughness: It’s called the 40% rule and here’s how it works. In December 2010, the first day after the Navy SEAL arrived at Itzler’s home, the Navy SEAL asked Itzler to show him how many pull-ups he could do. Itzler grabbed the bar and completed eight pull-ups. The Navy SEAL told him to rest for 30 seconds and do it again. This time Itzler completed six pull-ups. The SEAL waited for 30 seconds, looked at Itzler and told him to do it again. At this point Itzler could barely move and struggled to complete three pull-ups. After hitting his total max of seventeen pull-ups, Itzler stood up and told the SEAL they should go off to do something else. Itzler had already reached his maximum, but one step at a time the SEAL showed him how to use the 40% rule to overcome his mental barriers and complete a hundred pull-ups. So, what exactly is the 40% rule? We have the capacity to tap into the extra 60 percent of energy and motivation in moments of adversity and exhaustion. Think about the last time you pushed yourself beyond the limits of what you thought was possible despite your mental barriers. In those moments, you applied your own version of the 40% rule. The 40% rule is simply a mental decision to challenge yourself to push a little bit further, especially during moments you’d want to give up in any area of your life. Although some of the supportive evidence for the 40% rule is based on anecdotes, there are have been several studies suggesting that the “placebo effect”—i.e. anything that seems to be a “real” medical treatment but isn’t—could have a significant impact on our ability to perform a task. For example, during a 2008 study published in the European Journal of Neuroscience, researchers found that subjects who were offered a disguised sugar pill but told it was caffeine, were able to lift significantly more weight load in training than those who were really given caffeine. Whilst there’s still much room for further research into the 40% rule, research to date suggests that it may be possible to train your mind in developing mental toughness for better performance in whatever you do. Next time you reach that point of exhaustion during a run or pushing weights— when you usually would’ve given up— keep running for one more minute or complete another rep with your weight training. You’ll be surprised to see how much further you can push yourself. There’s a caveat here though. I’m not advocating pushing yourself to dangerous limits that could result in injury and damage to property. There’s a bit of nuance in this area that requires a bit of intuition and experience to know when you’ve truly maxed out. To avoid these risks, I recommend training in increments, i.e. small consistent increases over time. For example, during the initial stages of my sprint training, I would push myself to complete one set of push ups after completing the sprint workout. The following week, I progressed to two sets. The third week, three sets and so on. After three months, I introduced one more additional lap of sprinting, after I’d reached exhaustion from the sprint workout. By applying the 40% rule in increments as opposed to pushing yourself too much, too quickly, you can progressively push yourself with your training whilst minimising the risk of injury. Whether you’re a writer, athlete, entrepreneur, corporate professional or artist, you can apply the 40% rule to improve your performance at your work and becoming better at what you do. For example, if you’re a writer who would normally give up on writing for the day, following any experience with mental creative blocks, you could push yourself to wait by your writing desk for an additional 30 minutes. Enduring those 30 minutes may be torture at first, but it could also give room for the moment of breakthrough inspiration you’ve been waiting for. Personally, I’ve experienced way too many days and sleepless nights than I can count, many of which I thought I’d reached my breaking point to give up on writing. On average, writing each one of my articles can take anywhere from 6 to 20 hours for research, writing and editing.That’s a lot of time spent, especially when I have other responsibilities and work outside of writing. Whenever I want to give up, I use the principles of the 40% rule to keep pushing myself to write consistently and improve the quality of the work delivered to my readers. Relationships can be tricky especially when you’re dealing with difficult people, haters and critics. This could be your boss at work who never gives you any slack, a friend who always criticises your ideas or a partner who never takes time to understand your point of view. To avoid potential exchanges of insults that could cost you an important relationship or even your job, you can apply the 40% rule to expand your breaking point to higher levels. For example, the next time your boss or a colleague makes a rude comment or demands an unfair request from you, hold back from lashing out at them immediately and resist talking for 5 minutes. After 5 minutes of cooling off, you could then re-engage in conversations with the person. And who knows? you may discover that miscommunication, not ill will, was the root cause of their behaviour. Applying the 40% rule in this context will help you to improve your communication with people, no matter how difficult they can be. What do you do when you’re about to give up on a diet and exercise routine, business idea, new hobby, relationship or a career? Do you fold in and throw in the towel or do you keep pushing yourself further than you’ve ever done? The 40% rule is simply a daily choice to tap into your extra mental reserves to endure more than you think is possible. In a generation that strives to avoid pain and difficulties at all costs, the 40% rule is a reminder that the path to success is filled with unavoidable adversity and pain. Those who can can push past these limitations and struggles— stumbling from failure to failure—will eventually reach success in whatever they do. So what will you choose today— to give up at any sign of adversity or push yourself further than you’ve ever done before? In case you’re wondering or crazy enough to try them, here are a few of the workout challenges the SEAL asked Itzler to partake in during the one month stay at his home. You can read the rest of the workouts here. Workout: Run 4 Miles every 4 Hours for 48 Hours. This is almost 2 marathons in one day, plus you can’t really get any sleep with this one. Kudos to you if you’re crazy enough to try this one out. On a serious note, if you actually pull this off, please message me with your story. Mayo Oshin writes at MayoOshin.com, where he shares practical self-improvement ideas and proven science for better health, productivity and creativity.To get practical ideas for better habits, you can join his free weekly newsletter here. The name of the Navy SEAL is David Goggins— often referred to as the toughest man alive. David Goggin’s is an Ironman triathlete— who finished fifth in the 135-mile Badwater Ultramarathon in Death Valley. He also held the record for the most pull-ups completed in 24 hours (4,025). Image credit: please contact for inclusion if original owner.